Since the start-up of the water recycling systems supplied by Alfa Laval, Harinagar Sugar Mills has been able to recycle approximately 800,000 litres of water each day, at a cost the company considers very attractive. Cleaning frequencies turned out to be only about 50% of those for similar equipment available elsewhere, resulting in notable savings. The company also has made savings on water costs and energy costs as a result of implementing the Alfa Laval system. Harinagar Sugar Mills Ltd., in Bihar, India, was founded in 1933 and produces crystal sugar, industrial-grade alcohol, fuel ethanol, bio-compost and electricity. The company wanted to treat the water waste from its distillery operations as well as to recycle this water in order to save money on water, energy and treatment. The goal was zero liquid discharge. Harinagar Sugar Mills selected Alfa Laval to deal with the waste water issue using a six-effect evaporator (FilmVap, ViscoVap and Alfacond) that combines falling-film and forced-circulation design and stripping columns for degasification and condensate polishing for all the spent wash generated from the company’s distillation plant. 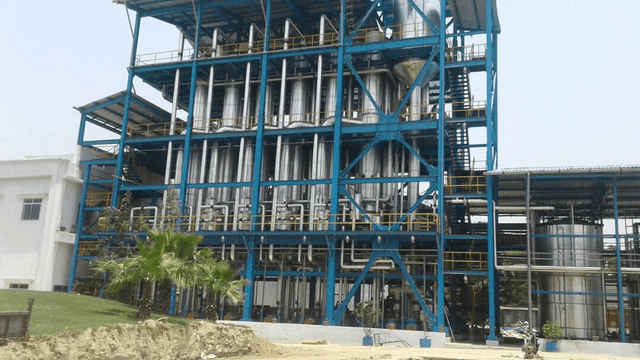 Alfa Laval had already been working with Harinagar Sugar Mills for 15 years, adding value to the company’s sugar operations by supplying plate heat exchangers, decanter centrifuges for spent wash clarification, an evaporator for bio-methanated spent wash and a condensate polishing system. Alfa Laval had also provided clarified juice heaters (complete with an automated CIP module), additional components for the evaporation system and re-boilers for the condensate polishing system. Harinagar Sugar Mills had considered solutions from other suppliers, but selected Alfa Laval because they were convinced by their previous experience of working with the company, and were also confident that the design of its engineered system for degasification and condensate stripping would work best to achieve high-quality water recycling. 18 months of technical and commercial discussions, tests and collaboration preceded the installation. Laboratory tests for feed analysis were conducted at the HSM plant. HSM engineers also visited existing Alfa Laval evaporator installations to see these in action. Producing alcohol in the Harinagar Sugar Mills distillery generates liquid effluent (the spent wash). This spent wash passes through a bio-methanation process to recover energy in the form of biogas that’s used as fuel in a boiler. After bio-methanation, the spent wash is fed to an evaporator for concentration and the concentrated liquid is then used to produce bio-compost. Dealing with this spent wash in an evaporator is very challenging, because it contains dissolved gases that include ammonia, carbon dioxide and hydrogen sulphide. Alfa Laval therefore supplied a specially designed degasification unit to strip out these gases. The condensate from the evaporator is another effluent that was difficult for the sugar mill to deal with because of its high COD and BOD levels. An Alfa Laval condensate polishing unit was installed to reduce those levels and improve water quality so that Harinagar Sugar Mills is now able to recycle this condensate as process water for the fermentation process, and as make-up water in the cooling towers. Since the start-up of the degasification, evaporation and condensate polishing systems supplied by Alfa Laval in 2017, Harinagar Sugar Mills has been able to recycle approximately 800,000 litres of water each day, at a cost the company considers very attractive. Cleaning frequencies turned out to be only about 50% of those for similar equipment available elsewhere, resulting in notable savings. The company also has made savings on water costs and energy costs as a result of implementing the Alfa Laval system. This is now the most successful plant of its kind in India, and the zero-liquid-discharge approach is clearly the way to go. We did a lot of research. Our team travelled to a few plants in India where similar processes are used, and we talked to a number of suppliers. In the end, we chose Alfa Laval because we were convinced about the technology offered and their experience with delivering it. We trust them. Recycle approximately 800,000 litres of water each day, at a cost the company considers very attractive. Cleaning frequencies turned out to be only about 50% of those for similar equipment available elsewhere, resulting in notable savings. Savings on water costs and energy costs as a result of implementing the Alfa Laval system. Alfa Laval offers a variety of solutions for on-site water and waste treatment plus recovery of water, heat and even products from your process.